Are you suffering from gift anxiety? Is the holiday season especially hard on you? Do you wish you could just give everyone a gift card to Amazon.com and be done with it all? Now there’s hope. For all the people on your list (except those who eat hot pockets for dinner and those who are too young to know how to hold a fork), we present the first annual Better With Lemon Holiday Gift Guide. All of the suggestions listed here have been thoroughly tested by our team of experts (ok, it’s just Steve and I) and they are guaranteed to spread joy to all (at the very least, to you, if you decide to buy all of these gifts for yourself). This is no ordinary peanut butter. It’s sweet and nutty, definitely crunchy, and absolutely irresistible. Spread it on bread and top with some honey and you have breakfast and dessert all rolled into one. Or roll one tablespoon of it at a time into a ball and the dip them in melted chocolate to create the easiest chocolate-peanut butter truffles you’ve ever made. Whoever you give this to will thank you and hate you, because no other peanut butter will ever measure up for them. This is for those on your list whose chores include washing the dishes. Perfect for scrubbing persistent stuck-on food from pots and pans. I use it on my cast iron skillet all the time. As you probably guessed by now from reading this blog, Steve and I eat a lot of ice cream. We’ve gone through several ice cream scoops until we discovered this one. It cuts through ice cream better than any other one we’ve ever used. And the stainless steel scoop doesn’t chip or discolor, even after multiple washes in the dishwasher. 4. Absolute Beginner’s Cookbook, Revised 3rd Edition: Or How Long Do I Cook a 3 Minute Egg? More than two decades ago, when I was a freshman in college, I cooked my first dish: instant ramen noodles. That was enough to get me interested in cooking. But I needed some help. So, off I went to the bookstore (we still had those back then) and this cookbook caught my eye. I used it non-stop and made some of the recipes in it for years to come. So, for those on your list who need an introduction to cooking, this is the perfect gateway drug. Steve and I have given this book as a gift to so many of our friends, that we should really start getting paid as its official marketing team. It is so worth it. Recipe after recipe, we have marveled at the simplicity and brilliance of what Marion Cunningham has put together in this book. It’s worth it just for the raised waffles recipe alone. Do you have someone on your list who has in the past remarked that they have a slow cooker that they never use? Give them this book and be prepared to be served slow cooker meals by them every time they invite you to dinner for the next two years. Not that you will be complaining. Yeah, sure, the best way to aerate wine is to decant it and let it breathe for a while. But who has time for that on a Wednesday night, when you Must. Have. Wine. Now. This aerator does the job in seconds. And as an added benefit, it serves as a perfect pourer, guaranteeing that you will not end up with drops of red wine on your table or your lap. What can I tell you? Just buy the damn thing for yourself and try to not eat a double portion of the stuffed eggplant the minute it comes out of the oven. Then, buy it as a gift for everyone you know. The word “nutty” was invented for this oil. It is the king of seasoning oils (yeah, I went there, olive oil). So, here’s what you do. You buy a bottle of this vinegar for someone who is very special to you. You give it to them and make sure that you are there when they open it. When they look at you with a puzzled look (“are you really giving me vinegar for the holidays?”) tell them to open it and get a spoon. Watch their eyes light up when they taste a spoonful. Then you taste a spoonful. Then they taste a spoonful. Then you taste a spoonful. Then they taste a spoonful. Perfectly sharp. Forever. No acid can corrode it. And things don’t stick to it when you slice them. It feels like a toy knife in your hand, but it can slice like crazy. Give it only to those who are careful with knives. Once a month you get three packets of carefully selected coffee. Each coffee is blind taste-tested by the people of Craft Coffee and each one is distinctly different. This one’s for the coffee lovers on your list. The Union Square market has been full of cherries the last couple of weeks, both the sweet and the sour kinds. 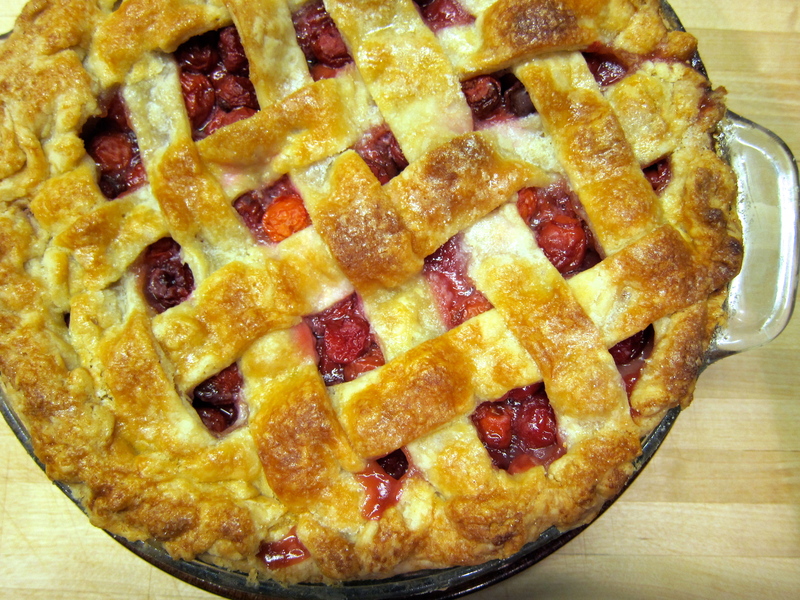 Sweet cherries are great for eating but sour cherries are really great for two things: sour cherry jam and cherry pie. I made the jam two weeks ago and last week, for July 4th, was the pie’s turn. The only problem with using cherries to make anything is that you have to first pit them. There are all kinds of opinions out there on what is the easiest way to do that (using a paper clip seems to be really popular) but I’m here to tell you that the absolutely best tool for the job is the Progressive International GPC-5000 Cherry-It Multiple Cherry Pitter . 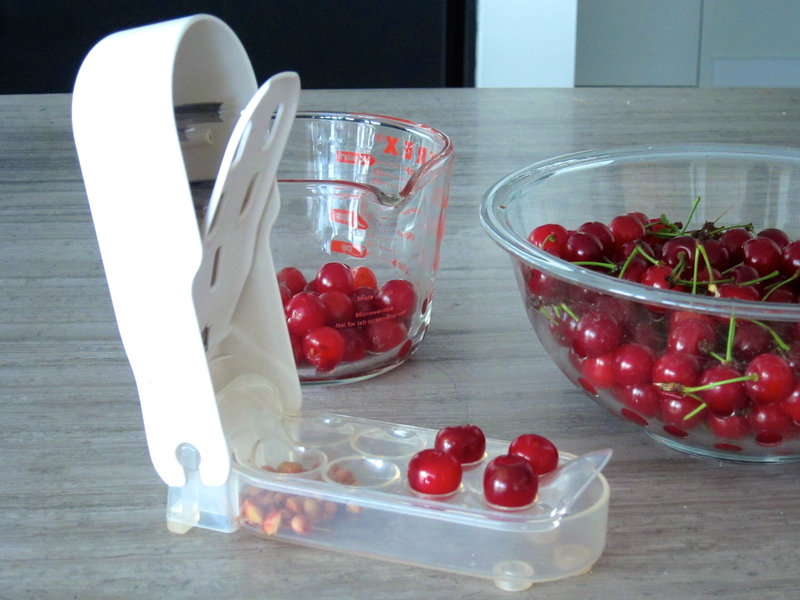 If you want to make anything using cherries, you have to get one of these. You place four cherries in each of the four holes (there are four large holes for sweet cherries and four smaller one for sour cherries), press the white top down and presto! You have four cherries pitted in less than a second. The pitter stays folded for storage and it’s dishwasher safe. With it, I was able to pit two and a half pounds of cherries in less than 20 minutes. Which is actually a lot longer than it took our July 4th guests to finish up their cherry pie slices. Don’t you hate it when you have to measure something sticky, like honey or maple syrup, or something thick, like sour cream or yogurt? You always end up trying to scrape it off the measuring cup or spoon and you never feel like you really got the full amount the recipe calls for. Well, the wonder cup comes to the rescue. Steve gave it to me one Christmas and I’ve used it countless times since. You just push the bottom part down to the measurement you desire, fill the top with whatever you need and then push everything out from the bottom up. It scrapes every little bit of the yogurt, or honey, or whatever you need into your bowl. 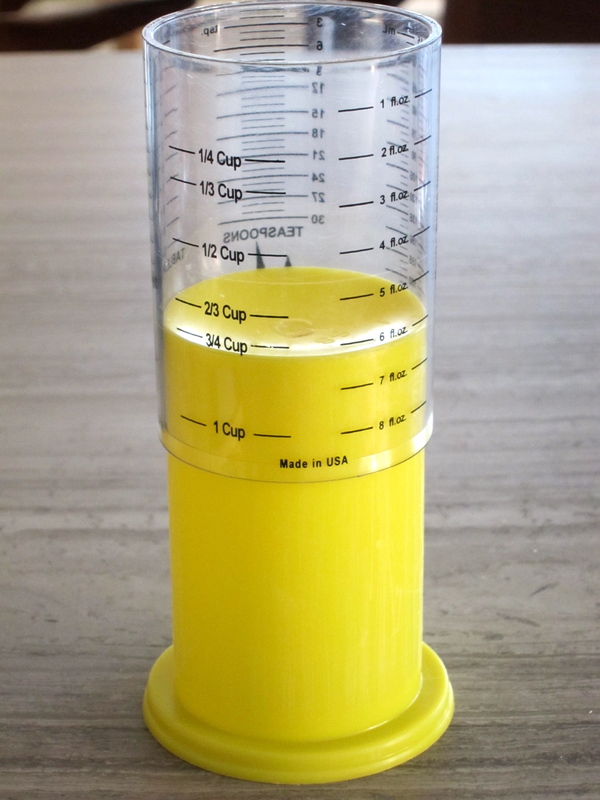 They sell these at Amazon in both yellow and white and in 1-cup or 2-cup sizes. So you know the story where you have a boyfriend who’s really nice, uncomplicated, reliable, and brings you simple joy and happiness but then you meet this other guy who seems to have more of everything – he has “initiative” (he’s started several companies that have failed but he’s trying, any day now), a great body, and promises of a lifetime of amazing adventure, so you dump your simpler boyfriend for this better one, only to realize after a few months that he’s no better at all, really he’s all show and no substance and none of his promises have or will ever be kept, so you go back to your nice first boyfriend who takes you back and everything is good with the world again? You know that story? Well, it happened to me, except instead of with boyfriends, it happened to me with ice cream makers. Ok, let’s get one thing straight. There will be several ice cream recipes in this blog. And if you are one of those people (like I used to be) who are completely dumbfounded by the phrase “freeze in an ice cream maker according to the manufacturer’s instructions” at the end of recipe, then here is the solution: buy an ice cream maker. It’s really, really simple. And cheap. Back to the story. 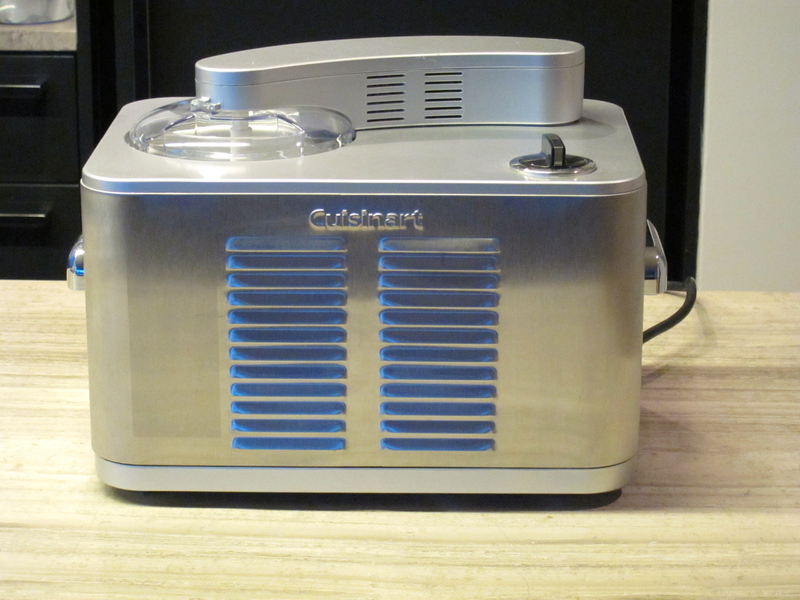 When I first started making ice creams and sorbets, I bought this simple ice cream maker,the Cuisinart ICE-21 Frozen Yogurt-Ice Cream & Sorbet Maker . I’m not even giving you the link to this one because I don’t want to encourage you to buy it. It was expensive (almost $300) but it had the one thing my old one didn’t: a compressor. So I didn’t have to keep a bowl in the freezer and I could make a batch of ice cream whenever I wanted. Plus I could make two batches back to back if I wanted since the compressor would keep the bowl cold. I think you see where this is going. 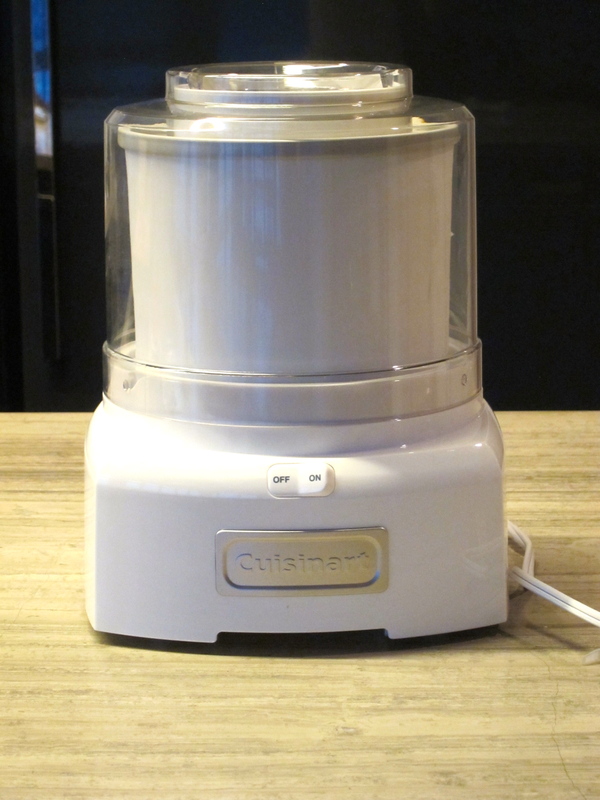 My original, simpler ice cream maker was quiet, fast (ice cream was ready in about 20 minutes), cheap ($50 on Amazon), and made smooth, delicious ice cream and sorbet (speed is important in ice cream making, in order to avoid crystals forming in it, which make it icy). But I threw it away for this monster that ended up being heavy, expensive, really loud, slow (45 minutes or more for ice cream), and almost never made a good batch of ice cream. So, I went back to Amazon and bought another one of my original ice cream maker and put the other one in a closet, until I give it away. 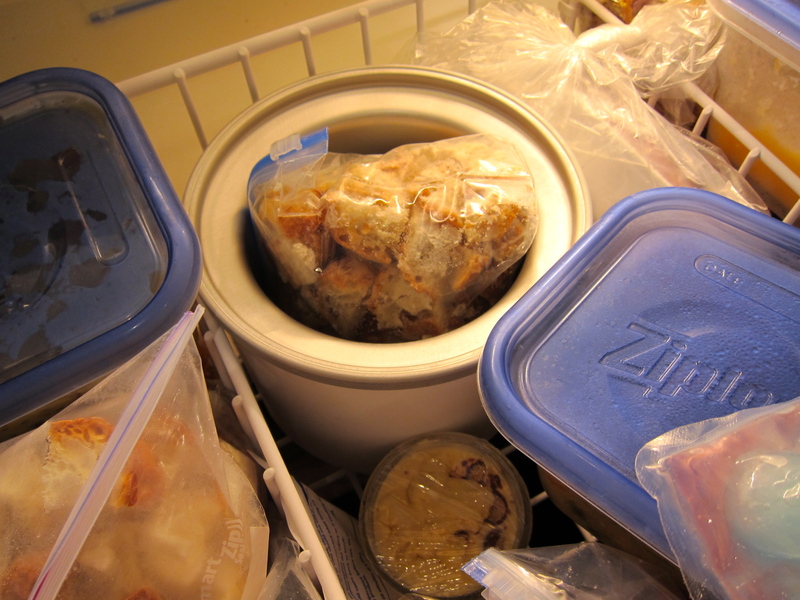 And as far as saving space in my freezer? Well, the bowl, being a bowl, is empty inside. So, I put things in it to minimize the space wasted. Like, for example, bread cubes I save from leftover homemade bread, which I use to make bread pudding (recipe to come). So, if you don’t have one, go and buy it at Amazon . And then, make a batch of Malted Milk Ice Cream.